JK Trail Cage 2007-2010 for Jeep Wrangler JK 2007-2016. The Poison Spyder Bolt-Together Trail Cage Kit (patent pending) is the strongest add-on cage you can bolt in to your JK. 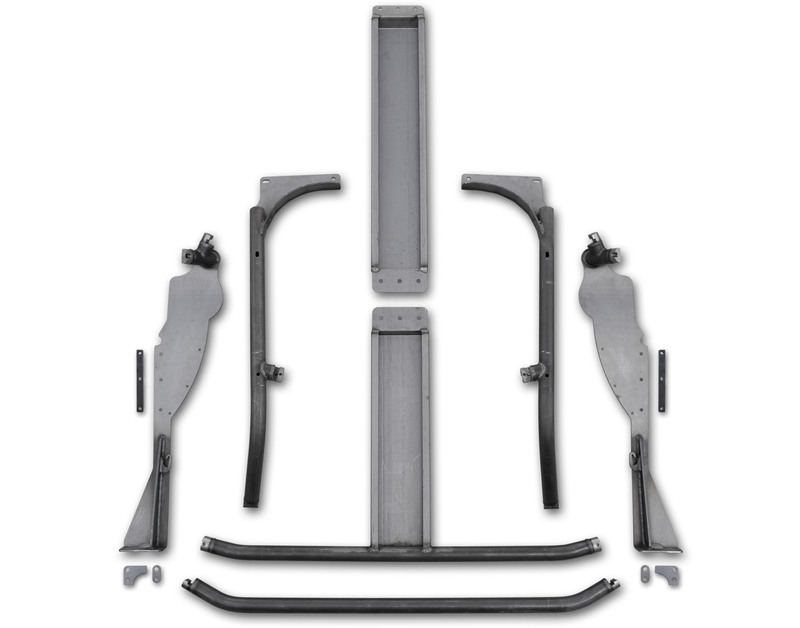 Designed to strengthen your Jeep existing roll bar, the Poison Spyder Trail Cage Kit fortifies the driver and passenger area by adding a robust cage fabricated from CNC laser Notched, NC-bent DOM steel tubing and CNC laser cut, precision brake formed 3/16 inch plate steel components. When shopping for a cage kit for your Jeep, make sure that any product you are considering uses stronger DOM, Drawn Over Mandrel structural tubing rather than the cheaper welded seam tubing that some manufacturers use. bolt-in cage kits need a way to join the structural tubing components of the kit. Popular kits on the market today use either a knuckle-style clamp or a simple tube insert with crush bolt. Both methods have their weaknesses. For instance the large knuckle style clamps may look beefy, but they are still pre loading a clamping force onto a rather thin wall tube, creating a dangerous stress riser right at the junction of two tube members where the cage is likely to see its Biggest stresses. Poison Spyder uses a system of CNC machined, solid steel interlocking tube couplers that are placed inline along the run of a tube member, rather than at the joints of the cage. These tube clamps are placed where the cage is Not likely to see side loads, however they are still stronger than the knuckle style clamp in a side-loading situation. At the tube junctions are the high quality, laser-Notched, professionally welded tube junctions you would find in a custom fabricated cage. The interlocking tube couplers are also lower profile, with the same outside diameter as the tubing itself, so it yields a sleeker, less bolt-in appearance. The A-Pillar section of the Poison Spyder JK Trail Cage Kit extends all the way to the floor of the JK with a single piece of CNC laser cut, precision brake-formed 3/16 inch plate steel. The A-Pillar hugs the contours of the Jeep dash ends perfectly, making the best use of the limited space available for an A-Pillar that does Not hinder legroom or ease of entry. The A-Pillar bolts Not only to the floor, but to the forward door post via a 1/2 inch thick strengthening rib, and also to the dash structure itself. The lower end of the A-Pillar is fortified with heavy duty gusseting. Competitors' cage kits either do Not include Full-height A-Pillars (stopping at the bottom of the dash) or require the purchase of a separate bolt-on lower piece. The Poison Spyder JK Trail Cage Kit includes Full DOM replacements for the cheap Stock header bars. The DOM tube structure of the header bars is integrated into the overall cage design to form a complete, well thought-out cage structure. Some competing bolt-in cages retain the use of the Stock header bars, clamping the added-on components to the weak thin wall Stock tubing. The Poison Spyder JK Trail Cage Kit includes DOM tube crossbars just above the dash and at the top of the windshield, to provide structural rigidity and side-load strength to the cage. The upper windshield crossbar is compatible with the popular sPOD power disctribution system switch panel, as well as the OE sun visors. The dash bar tightly hugs the top of the Jeep dash, but is compatible with the factory tweeter speakers. By using Poison Spyder interlocking tube coupler system, these horizontal members of the cage bolt together while preserving the strength of a traditional welded cage. The center overhead stringer on the Poison Spyder JK Trail Cage Kit is fabricated from CNC laser cut, brake-formed 3/16 inch plate steel. Other cages on the market use two pieces of tubing for the center stringers, but Poison Spyder 3/16 inch plate steel piece provides ultimate overhead protection, great looks, and a convenient flat mounting surface for items like CB radios, switches, dome lights, etc. The top of the stringer box is open, for easy access for wiring, or as a convenient place to store maps under a soft top. Entry Grab Handles may be added to your JK Trail Cage Kit, by selecting it from the options when adding to your cart. These handles are NC-bent, 1.25 inch OD DOM tubing, and designed to aid ease-of-entry as well as provide a solid grab point for driver and passenger while four-wheeling. The handles will come already welded to the Trail Cage. Poison Spyder signature MIG welds are widely recognized as the best looking welds in the industry. For some, however, the lower profile, cleaner look of TIG welds may be desired. TIG welding is a higher skilled, more time-consuming process so there is an up-charge for this option.